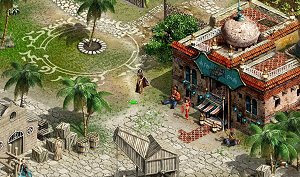 Nadirim is an original free-to-play browser-based game set in an Arabian fantasy background. The creators drew inspiration from the classic Arabian Nights tales, a source that is still barely exploited in the MMO world. Nadirim features all the mythology one could expect from such a theme, including baffling princesses, djinns, potions, mischief and a massive open world. The amazing graphics are some of the best ever seen in a browser MMORPG and there’s a lot to do gameplay-wise, from exploring and uncovering the storyline to fighting other players in an exciting turn-based combat system.